Bibby’s and their sports day at Court Hey he was spotted by Pembroke stalwart, Bobby Cooke, and was soon in the club colours. In 1931 he won the District Junior Cross Country Title and was third in the West Lancs. This began a career that included many wins over the country and track. He had many famous battles with the Wirral athlete, Sammy Dood. 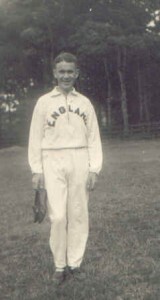 In 1934 he reached the the ultimate goal of gaining an England vest by finishing 12th in the National at Alderley Edge. At the International at Ary he narrowly missed out on a team place finishing 7th counter in a victorious team. During the track season that followed he won the Northern 6 mile title and had intended to drop out as he regarded it as merely preparation for a AAA 3 miles attempt but when the favorite George packed it in his Pembroke supports willed him on to victory. Then came the war which wrecked many a promising career. However, in 1947 at the age of 35 he set about his toughest training schedule ever and was rewarded with a stunning third place in the National at Durham. This has been equaled since by Marty McLoughlin, but never surpassed by a senior man, He failed to make the counting team at the International in Paris. Norman always preferred to run on the track and won many titles but his best performances came over the country. Norman, died suddenly in hospital in Oxford on Friday 21 October 2005 aged 94. He’d lived a long and fruitful life keeping active until the very end. His interest in athletics and Pembroke never waned.